At Ascension Seton, we believe in providing the best care possible, delivered with the dignity and respect that everyone deserves. It’s our way of putting the human touch back into healthcare… the way it was always meant to be. That includes the care we provide outside the walls of our hospitals and clinics. 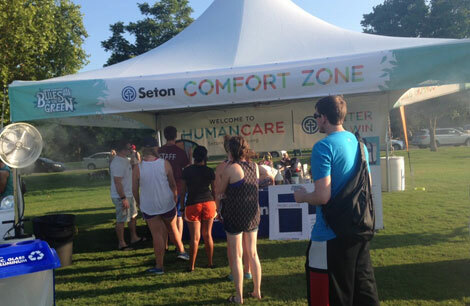 Ascension Seton has a long history of caring for our Central Texas community, and one way we are helping keep you safe and healthy is by providing the Ascension Seton Comfort Zone at events throughout the community. At the Comfort Zone, you’ll find the little things that you might need most in that moment, provided with a smile by our caring volunteers. That may mean helping you stay hydrated with free drinking water on a hot day, blister-free with a bandage, protected with sunscreen, or cool with a fan. Because that’s the human thing to do, and everyone needs a little TLC sometimes. We look forward to seeing you at the Comfort Zone!